IPCC release a report about every 5 years. A number of different organisations use the data developed by IPCC to produce modelled climate data for the globe. At Seeds of Life, we have downloaded and analysed data modelled by CSIRO for the region of Timor-Leste. The data is free and the analysis is performed using free programs such as DIVA-GIS and QGIS. The IPCC5 predictions can be compared to a baseline model called Worldclim which models the rainfall and temperature based on data from 1960-2000. By 2050, the temperature is expected to increase by 1.3oC and the total annual rainfall is expected to decrease by 12%. Predicted changes are not uniform across the country. Suco specific information on climate change can be found on our Suco Information Sheets. During the cropping season, many farmers do not generally experience a shortage of water for their crops although dry periods of 2-3 weeks during the wet season can lead to some wilting of maize. In the future there may be more dry periods like this. Increasing organic matter in the soil and leaving a mulch cover will greatly improve the soil moisture level during dry periods. We recommend intercropping velvet bean with maize to increase soil organic matter. Recent research indicates that increased temperatures may lead to a reduction in maize yields in warmer climates along the coast. However, temperature increases will lead to increased yields at higher altitudes for farmers who do not take any measures to improve soil fertility. By following these recommendations, farmers can build resilience for climate change. The impact of climate change on the ENSO cycle (El Nino and La Nina) is still uncertain. It is known that during El Nino rainfall will decrease on average by 17% and during La Nina it will increase by 19%. So if a community can improve resilience to current climate variability caused by ENSO then they will be much better placed to cope with climate change in the future. It is difficult to determine if extreme weather events will be more frequent or intense. However, the climate in Timor-Leste is known to have quite extreme weather – high winds, heavy downpours and extended dry seasons. It is important that organisations are familiar with the sort of extreme weather that can occur in their particular area. 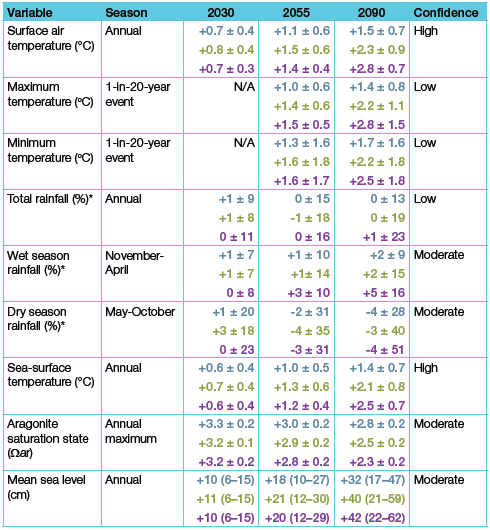 We recommend you refer to data in our climate and weather section such as the “Santiga File” which will indicate how extreme the rainfall can be compared to recent years. The National Directorate of Meteorology and Geophysics (DNMG) have also recently digitised around 20 years of daily historical weather data from 1954 until 1974.